This wonderful little piece comes from Slate in the Vault blog. 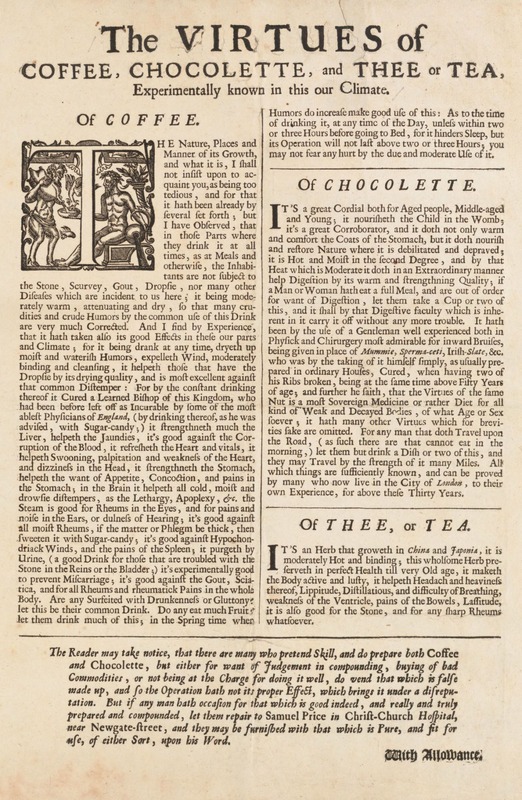 It’s a great broadside advertisement from a 1690 coffeehouse entrepreneur claiming the benefits of our now most commonly used drug on Earth, caffeine. Coffee was known in Europe but new as a common drink and still a bit suspect since it came from Arabia via the Arabs. The digital “original” is available through the Harvard University Library for download, or just click the image above to have a closer look. Price’s advertisement’s litany of claims for coffee’s health benefits mix advantages we’d recognize today with others that seem far-fetched. The authors observed that coffee-drinking populations didn’t get common diseases: “the Stone” (kidney stones); “Scurvey, Gout, Dropsie” (edema, or retained fluid). Speaking to an audience that still believed in the theory of the four humors, they argued that coffee, being “drying,” would help fix “moist and waterish Humors.” People who couldn’t hear well, or suffered from lethargy, want of appetite, or swooning, would also find the drink helpful. “It’s experimentally good to prevent Miscarriage,” they added, apparently not wanting to claim too much. I hope I can, at least, avoid the “moist and waterish humors” for some time to come.